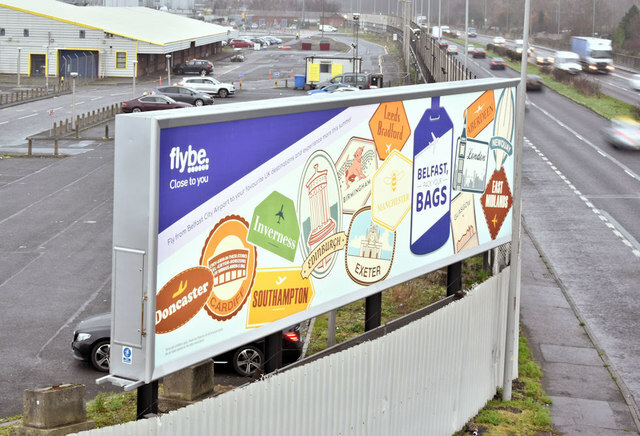 Flybe “Pack your Bags” advertisement beside the Sydenham bypass. It lists all current routes from Belfast City. Might be interesting, in January 2020, to see which remain if (or when) the airline is sold. Approximately 2½ miles of dual carriageway forming part of the Belfast – Bangor Road. It runs from the end of the M3 to Tillysburn, parallel to the Belfast – Bangor railway and also serves the George Best Belfast City Airport. It replaced the Holywood Road as the main road to Holywood and Bangor. There are plans for major improvements at the junction with Dee Street.